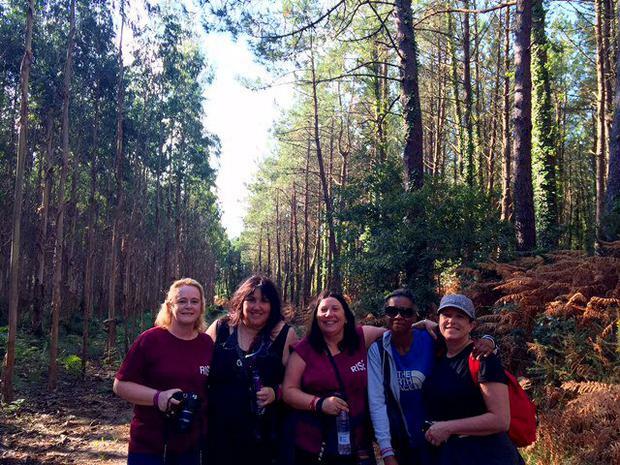 Andrea, Mary, Mags and Cathy on Day Four of their 115km Camino trek. Andrea Smith documents the final two days of her 115km Camino trek... and learns a few things about herself. Pulling on the walking shoes in Larry’s hotel was hard today with all the blisters, and I anticipated a difficult day ahead. I had planned to walk by myself again, but the remedial class of Cathy, Harry and Mags, plus Mary who normally zips ahead like Rob Heffernan, had other ideas. I kept urging them to go ahead, but they sternly told me that they would decide what they wanted to do and would move ahead when they felt like it. So with me firmly told, we walked through by the pretty harbour village of See and passed a children’s playground, where we had a bit of fun as Cathy and Mary decided to try out the slides and swings. Then we headed out to the hills, and as we ascended upwards, we stopped every five minutes for a little rest. I have to say that for all my stoic martyrdom yesterday, having company definitely made the journey pass more easily, as we chatted and laughed through the hard bits and pointed out interesting things en route. We were strolling along at one point with Harry, Mags and Mary slightly ahead and Cathy and I bringing up the rear, when a skinny French man caught up and asked if he could take a picture of us. He explained it was for his wife, “ma femme,” and while that was a bit weird, you meet all sorts on the Camino and I thought maybe he was blogging about the people he was meeting along the way, or something. We agreed, and the ever-funny Cathy was posing up a storm for him, giving him the thumbs up and telling him to make sure he got the logo on her hat in - she being a passionate fundraising supporter of Rise, the charity we were walking for. After he’d taken his shot, he thanked us and began to describe in French why he had taken our picture. His wife, he explained, was fat and while he was walking to Finesterre, she had declared that she wouldn’t be able for the journey and was going there by taxi. He was delighted to see myself and Cathy on the Camino, he said, gesturing towards our stomachs, and was going to show his wife the picture to demonstrate that if other fat women could do it, why the hell couldn’t she? Cathy, who understood not a word of this, was nodding and smiling encouragingly as he babbled on castigating his “lazy” wife, whereas I, who understood every word thanks to my Leaving Cert French, was dumbstruck. I couldn’t tell Cathy what he had actually said until he was safely out of reach, and when I did, she was so horrified and enraged that I reckoned Jack Sprat, as we later christened him, was lucky to have escaped with his life. Cathy can only stay mad for two seconds though, and within a minute we were clutching our sides with the laughter and rolling around with mirth. God help his poor wife, we concluded, having this charmer for a husband. Cathy immediately picked up a stone and carried it along for his her troubles, and we fervently hoped that seeing our picture would inspire her to get rid of twelve stone of ugly flab - him!!!! Mary, Mags and Harry were waiting for us around the corner, and they were also most amused when we told them, and we laughed about it for the rest of the day. We stopped for lunch at Playa de Sardeneiro, and it was fantastic and so reasonable. A couple of bottles of vino may or may not have accompanied the meal, and we had loads of fun and laughter. You can either walk the main road to Finisterre or go over the mountains, which is steeper and probably the true pilgrim way, so we opted to walk along the road. It was great fun, as we stopped for ice cream and plenty of breaks along the way, and the funniest part occurred when we passed by an orchard and someone had the bright idea that we should rob a few apples. 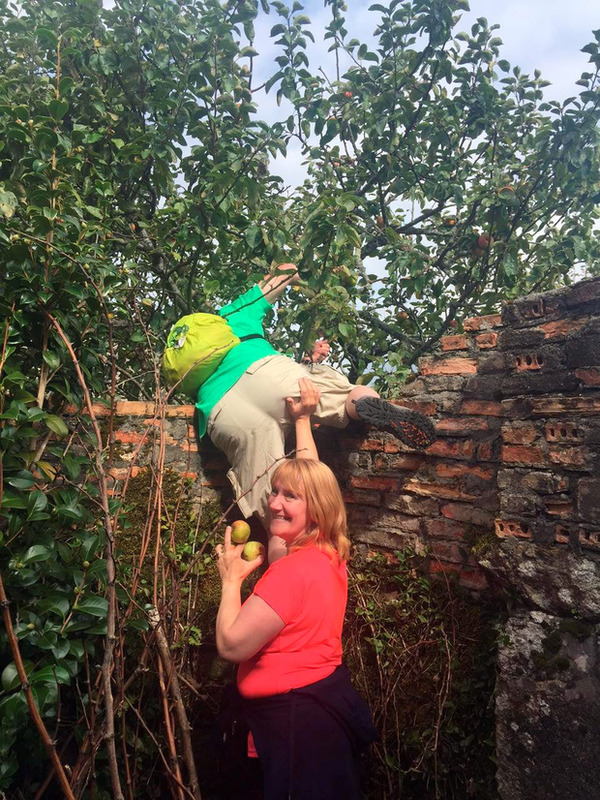 Harry volunteered to climb up the wall to do the deed, with Mary holding him steady by the seat of his pants, while Cathy, Mags and I roared with laughter. So funny, five grown adults on a pilgrimage robbing apples like kids, but they were delicious. As we walked into Finesterre, the sun shone and the view was utterly spectacular. When the Camino pilgrimage started in the 13th century, before Christopher Columbus set sail for the new world, people literally believed Finesterre was at the end of the earth. The reason is that while you can see a bit of the land on the other side of the huge cove that it sits in, there is water in every direction that you look. We found some picnic tables on the way in and sat and basked in the sunshine and the views, and then strolled along into the village, admiring the sand and sea and stunning scenery all around us. 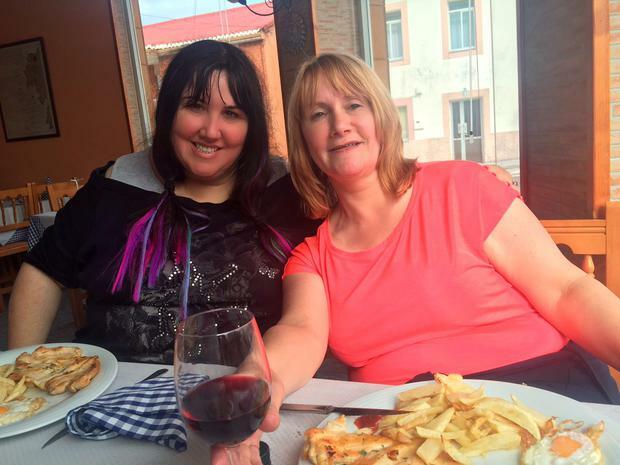 We had one moment of exasperation where we took the wrong hill up to our hotel, Prado da Vina, but other than that, we laughed and joked and had the best fun that entire day. It was only 17km so a lot less intense than the other days (gas how I now think 17km is practically a walk in the park) and I learned a valuable lesson that while I may be fiercely independent and proud, sometimes, to quote the Beatles, you really do get by with a little help from your friends. 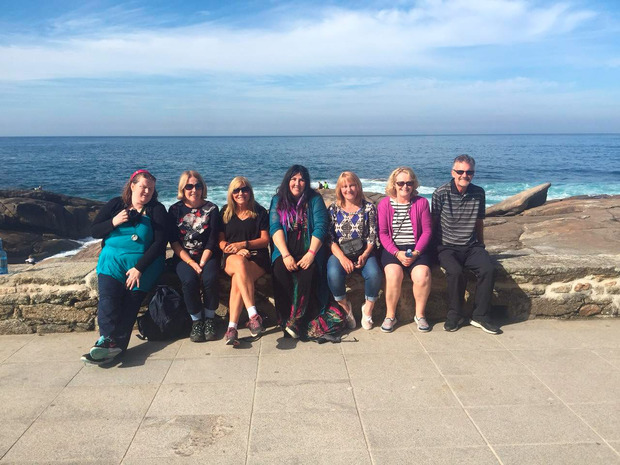 Prior to having our gorgeous dinner, Frances Black hosted a reflection group, where people shared their stories of what made them do the Camino trip and what they had gained from it. It was really moving as various people discussed bereavements, redundancies, significant birthdays and other personal issues that had inspired them to take a week out, and everyone, without fail had gained something special from it, not least a new bunch of friends. We had a gorgeous dinner after that and prepared for our final day, walking from Finisterre to Muxia. Today a taxi dropped us to our starting point and Harry, Mags, Cathy and I embarked on our final day together. It was a day full of nature as we met cows, donkeys, sheep, cats and dogs and pigs on the way, and the 20km walk was not too intense, just a few uphills, some steep downhills and plenty of flat walking. ‘The remedial group’ were sent off in the first taxi while some of the fitter among us had opted to walk from the hotel rather than get a taxi (adding an extra 10km to their trip). As we ambled along. the others eventually caught up with us at various points, and we had a great bit of banter en route. There was nowhere to stop to eat so we had brought snacks and drinks, and Harry and Mags eventually decided to up their pace a bit while Cathy and I walked along at a more leisurely pace, putting the world to rights. When we strolled into Muxia at tea time, our breath was taken away by the stunning seaside landscape of cliffs and rocks and sand and a marina, and the fact that the sun was beaming down meant that it looked like paradise. We were tired and weary as we walked to our gorgeous hotel, A de Lolo, but as we arrived at the front, elated to have finished our fifth and final day on the Camino, some of the group were sitting outside having a drink and they cheered us on and came and hugged us. That night, we had a lovely celebratory dinner in the hotel, and were all delighted to have finished, with the certificate to prove it. We have the next day and a half free so will spend some time in Muxia, where I hope to go for a swim in the sea, and back for the final night in Santiago, where we will visit the cathedral, go shopping and have some fun. After all the hard work, it’s time to let our hair down. 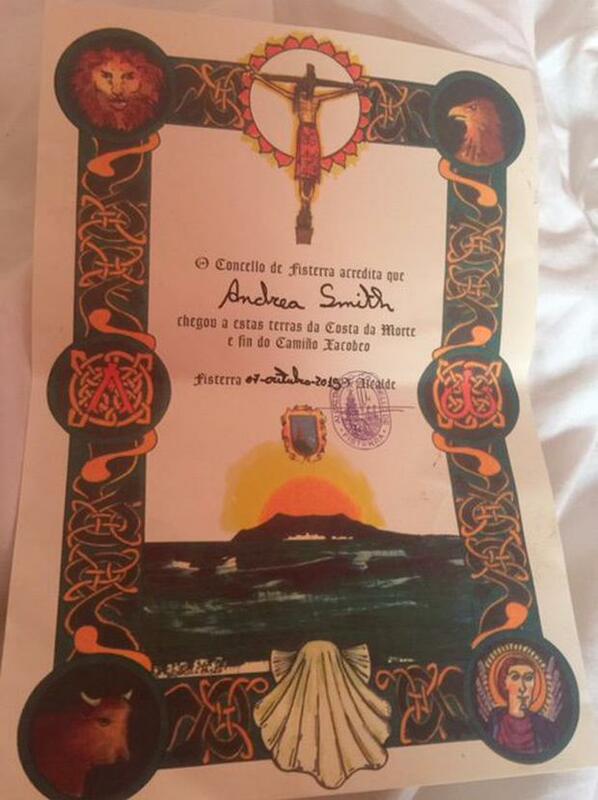 So what have I learned from doing the Camino? Well, I’ve realised on this trip that while I like to think I’m pretty strong and sorted in my mind, emotions and spirit, my weak spot is my physicality as I tend to live in my head rather than my body. This trip has taught me that I am stronger, physically, than I imagined, and that actually I have been able to undertake this tough physical challenge with only a few blisters and a bit of chafed skin to show for it. I think I had kind of written off my body in some ways, but actually this trip has shown me what it can achieve and how resilient it is, so I suppose I’ve gained a grudging bit of respect for it. I’ve actually really enjoyed being out in open air, taking in nature and scenery and breathing in fresh air, and even though it was hard at times, particularly during the first few days with thunder, lightning and hailstones to contend with, it made this final, gorgeous stretch even more special and magical. Looking back, I can’t believe I walked a leg of the Camino, and even though I don’t see myself changing into a hill-walking, gym bunny any day now, it certainly wasn’t half as bad as I anticipated. I was joking to the gang that my next challenge will be from Camino to Couch, where I would morph back into my default couch potato and take great pleasure in eating my way around Dublin to put back on the two stone I lost! Although, I have to confess that I heard myself saying “Next year I…” twice today, which kind of horrified me, as it seemed to be suggesting that some part of my brain is considering coming back and doing another leg of the trip with Rise next year. I really don’t know where that’s coming from!! 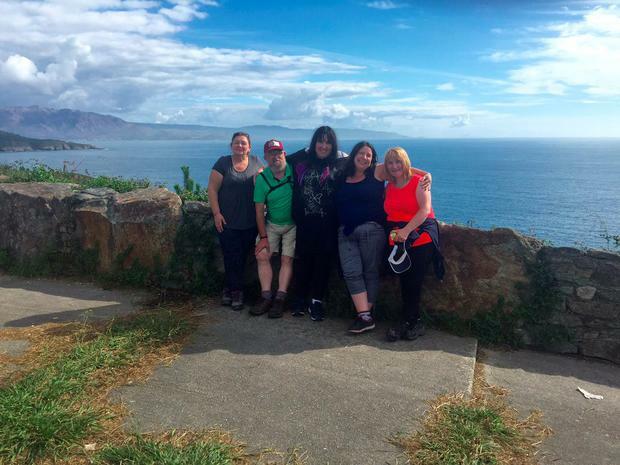 When I was documenting my progress leading up to the Camino trip in Health & Living in the Irish Independent, two really gorgeous readers, Pauline and Mary, were inspired to come along on the trip too. They both said today that they were thrilled to have done it, and it was an even better experience than they had anticipated. The whole group was amazing, and everyone was lovely. There wasn’t even one person who got on my nerves, which is saying something. Of course, that probably means that I was the one who drove everyone else mad - there’s always one! I was also delighted to raised some money for The Rise Foundation, which helps families who have loved ones who are, or have been, in the grip of an addiction problem of any sort. Singer and former addict Frances Black was inspired to set up the charity, having become an addiction counsellor, as she realised that there were very few services out there to help the families. As Frances explains in this video in this piece, Rise doesn’t get government funding and the Camino is its biggest annual fundraising event, so If you would like to come along next year, visit www.therisefoundation.ie for contact details. The gorgeous guys Umberto and Alberto from Dublin-based Follow the Camino have been absolutely superb in organising this trip and minding us along the way, and they made everything so easy and smooth. They were so kind and sensitive in dealing with a liability like me as well. They organise individual and guided trips to the Camino and other places and are really helpful and professional. And finally, thank you to the readers of Independent.ie and all my family and friends for all the support, sponsorship, encouragement, tips and lovely messages. I had a blast and you are all legends! Adios for now from sunny Spain!